None of us likes mosquito bites, but we become their regular victims as soon as the summer embarks. Despite the irritating itching that follows their bites, mosquitoes bring about other health concerns as well, as they can spread diseases and viruses such as the Zika virus. As soon as they bite us, mosquitoes draw out blood and at the same time, inject some of their saliva, that contains proteins and anticoagulants. These proteins trigger our immune system since they are foreign substances, and our body starts releasing histamine in order to neutralize them. This compound helps the white blood cells to reach the affected area, but it also causes the swelling, inflammation, and itchiness. 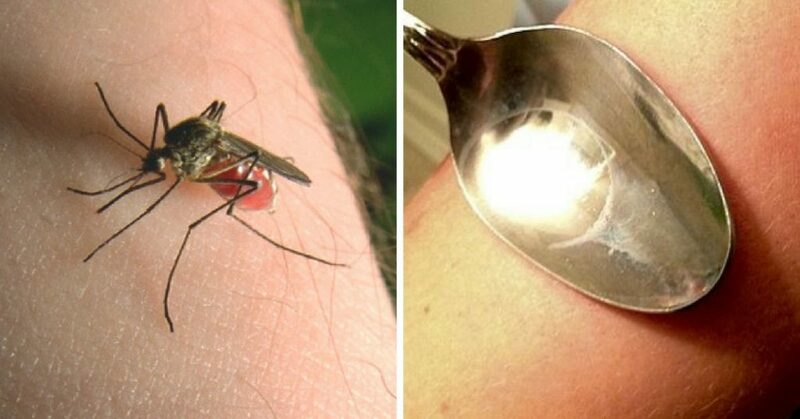 In the middle of the summer season, and the many mosquitoes that have probably already got you, we decided to share some simple ways that will help you stop the itching due to their bites and finally realize that these little pests are less powerful than you think. What’s best, most of the things you’ll need are already around your home, so if you cannot avoid their bites, you can definitely relieve their annoying consequences. Cover up the bite with a piece of scotch tape, or a band-aid, as soon as possible, and the loss of air supply will prevent the itching. Yet, do not leave it on the skin for longer than a day, as the skin needs to breathe. Mince some garlic and dilute it with coconut oil. The strong anti-viral properties of garlic will help you treat the itching. Apply some honey on the bite to heal it as quickly as possible, due to the powerful antiseptic and anti-inflammatory properties of honey. Boil 2 cups of water and add 1/2 an ounce of dried basil leaves. When cool, soak a washcloth in the rub and apply it on the bites. You can also rub fresh basil leaves on the affected area. Apply ice to the bites to reduce the swelling and the blood flow, and stop the itching. Add a bit of oatmeal to your bath and enjoy the soothing experience. For even better effects, you can add some honey to the water. All you have to do is to put a teaspoon under warm water to heat it up, and then place it on the bite. The warming sensation will break down the protein injected with the bite and thus treat the itching. Mix some baking soda with a few drops of water and apply the paste directly on the mosquito bite. This will neutralize the itching by balancing the pH levels of the skin. The Aloe Vera gel has potent anti-inflammatory and cooling qualities that will relieve the itching due to mosquito bites. Tea bags will draw out the toxins from the body, so put a used tea bag on the bite and it will reduce the residual itch. Do not doubt to try these simple tips next time you are a victim of mosquitoes, as they will definitely save the rest of the summer!